The alleged hunger strike that thirteen inmates claimed they have been observing since the beginning of current March proved ultimately to be a mere farce meant to lure sympathizers. 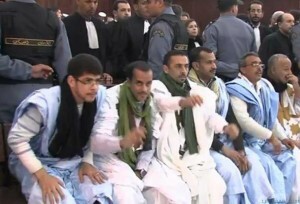 The thirteen detainees, including Ennaâma Asfari, have been convicted for the murder of eleven members of the security forces in the Gdeim Izik tragic events and are currently serving their prison sentence in the “Zaki” prison in Salé, Rabat’s twin city. They created this hunger strike subterfuge as a French court is about to issue, on April 4, a ruling on an odd complaint on alleged “torture” filed on behalf of Asfari against Moroccan authorities. The detainees, most of whom being fanatical supporters of the separatist thesis of the Polisario, are seeking, through their relays abroad, especially in France, to create a media hype about the case ledged before a French court. On the ground, things are completely different. For the DGAPR, the reasons for this alleged hunger strike “have no relation with their detention conditions.” Their move is designed to mislead the public opinion through presenting themselves as victims. “Through the observation of their activities and according to the results of medical checkups some of the inmates have undergone at their request, in public hospitals, 22 days after they started their alleged hunger strike, it turns out that their health condition is normal and does not raise any concern,” said DGAPR.